Scotland’s Voices is the new composite portrait by Alexander Moffat OBE RSA, companion painting to Poets’ Pub (1980, Scottish National Portrait Gallery, Edinburgh). On tour throughout Scotland, the gallery is very pleased to announce the painting will remain with us in St Andrews until early summer. “. . .both Poets’ Pub and Scotland’s Voices may be seen as a coming together of the literary and the oral traditions, both complementing each other, a truly Gramscian conclusion that MacDiarmid and [Hamish] Henderson would surely have approved.” – Alexander Moffat, in the Landmarks exhibition catalogue. 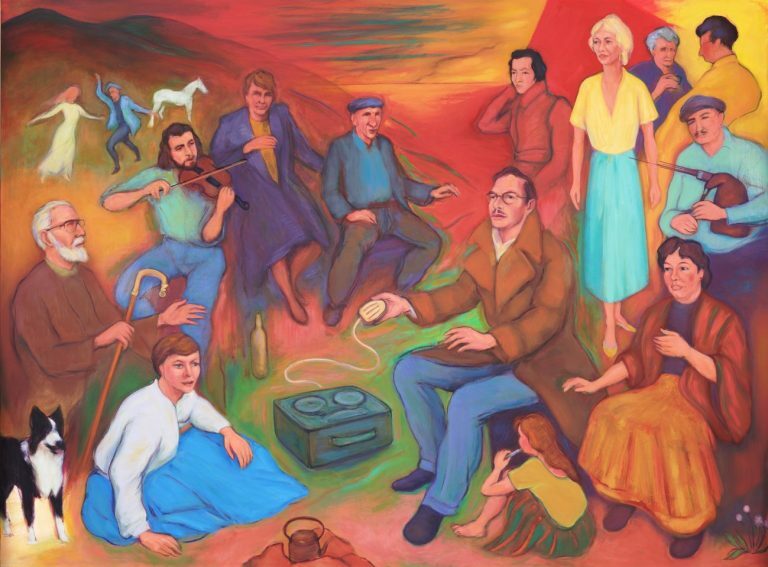 Depicted in the painting are: Jean Redpath, Willie Scott, Aly Bain, Belle Stewart, Jimmy MacBeath, Hamish Henderson [central figure], Heinrich Heine, Dolina MacLennan [standing], Hugh MacDiarmid, Antonio Gramsci, Allan MacDonald, Jeannie Robertson. Alexander Moffat is one of the foremost portraitists of the 20th and 21st centuries. He was head of painting and printmaking at Glasgow School of Art. He is also a writer, with several books written collaboratively with Alan Riach, Professor of Scottish Literature at Glasgow University, including Arts of Resistance, Arts of Independence and Arts and the Nation. Alexander Moffat’s work is held in public and private collections nationally and internationally. He was awarded an OBE in 2006 for services to the arts. A ‘visual tour’ of each element of the painting can be found on the gallery’s Instagram site. Literature: ‘Facing the Nation: The Portraiture of Alexander Moffat‘ by art historian Bill Hare (Edinburgh: Luath Press, 2018); ‘Landmarks’ catalogue. Greentrax records have released a CD of music by the figures depicted in Scotland’s Voices. The CD includes tracks by Jeannie Robertson MBE (MacCrimmon’s Lament and The Battle of Harlaw); matriarch of The Stewarts of Blair, Belle Stewart MBE (The Berryfields of Blair and The Queen Among The Heather); bearing a wealth of Gaelic song and originally from Lewis, Dolina MacLennan (Tha Mi Duillich); and one of the three piping MacDonald brothers of Glenuig, Allan MacDonald (Thogail nam Bó) amongst them. The good folk at Greentrax also included a self-penned track by Hamish Henderson (The Freedom Come All Ye) and a key figure in the painting, Hugh MacDiarmid, introducing and reciting a short poem (The Watergaw). Take just one moment more to order the CD from Greentrax themselves, instead of going to the default mega-stores online – it helps the small independent producers thrive! Price on application from public galleries and museums in Scotland.